Heating and cooling of indoor space is one of the biggest energy wasters in our homes and businesses. What if we could let the earth do this naturally for us, reducing our heating and cooling costs by as much as 50-70%? A geothermal heat pump moves heat into or away from the earth through a ground loop system (a system of pipes that run deep into the ground). It quietly and comfortably controls the temperature in the home, providing more consistent heat that stays on longer and changes the temperature more gradually. It also has the capability to heat water in your home in place of a traditional water heater. In the summer, the system works as a cooling system with no need for a separate air conditioning system. The geothermal heating system is made up of 3 main components: the ground loop system, the heat pump furnace unit, and the distribution system. The ground loop is a system of polyethylene pipes which extract heat from soil beneath the frost line deep into the earth. In the cooling mode, the pipes return heat to the earth. The heat pump furnace unit moves heat from one place to another, and the distribution system channels it around your home through duct work and vents. A geothermal system starts at about $20,000. With federal and provincial incentives and rebates, you can receive about $7,000 back on your system ($3,500 under federal rebate, matched in Ontario), provincial sales tax can also be waived, resulting in a further savings. Ontario also has programs for those who qualify for between $8,000 and $9,000 in possible rebates. See below for links to rebate programs. Geothermal heating and cooling is best for new home construction or in rural areas since these present the fewest construction barriers when installing the system. Low levels of electricity are required to move the heat about, but electricity is not required to create the energy. There is no combustion taking place, therefore there is no need for a chimney or flue and there are no combustion hazards or concern for carbon monoxide gases. Since the entire system is either indoors or below ground there is little potential for vandalism or destruction from weathering that can occur with other cooling systems. Other than at installation, noise from the system is minimal. The initial costs are about two times as high as normal heating systems, but when you consider that the system is also responsible for cooling, the costs don’t seem nearly as high. Payback for the system can occur from savings in only 2-7 years, depending on which fuel/or system you are trading from. Most systems come with 10 year warranties, but can last much longer (20-30 years). The pumps have an average life span of about 20 years. The earth energy pipes are typically warranted for 25 years, but have a useful life of 50 years if maintained and installed properly and depending on local conditions. The best time to think about geothermal heating or cooling is when it is time to replace your old furnace. With rebates and incentives, the cost is not significantly higher than traditional systems and can result in great overall savings. There are some concerns over the use of geothermal energies. These systems are different than the air to air heat pumps that were installed in the 1950s and 60s. They have become much more efficient and environmentally sound, and the more they are installed and used, the more options will start to come out and the cheaper they will become. There are environmental impacts to consider when heat mining (which is what geothermal essentially is doing) and an environmental impact assessment (EIA)should be done in advance of any development to make sure the ground is suitable for this type of extraction. You are getting heat from deep aquifers in the ground, and in this process certain minor emissions of gases from the earth are possible. Geothermal heating is said to produce approximately 79 g/kWh of CO2 when the electricity is generated. Compared to the 955 g/kWh of CO2 emitted from coal generated electricity, this is significantly less. There is also the possibility of waste water pollution if the waste water is not treated properly. Solid wastes of calcite and silica are also possible to deposit in the pipes as travertine and siliceous sinter build up. These can cause blocking of pipes and boreholes and reduce the permeability of aquifers being developed. The environmental impact assessment should detail ways to help reduce these negative impacts. If done properly, the system should be significantly less wasteful and environmentally impacting than traditional systems. Geothermal heating and cooling is not for everyone, but for new home construction or rural properties it can make a lot of sense. It is best when used in combination with other renewable energy systems so that the electricity needed to move the heat can be created renewably and so the environmental impact is less and the home is more self sustainable. Check out http://www.earthheat.ca/ to find an Ontario installer. Cambridge Hydro (rebate of up to $1,500), call them directly at (519) 744-9799 to find more details. If you would like more details on rebates and incentives, please talk to me. Can wind energy work to power our homes? It costs anywhere between $2,000-$8,000/per kilowatt power produced to purchase a small wind turbine. 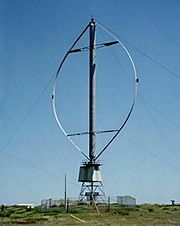 However, the wind turbine costs represent only 12%-48% of the total cost of a small wind electric system. There are also costs for other components, such as inverters and batteries, as well as sales tax, installation charges and labour. 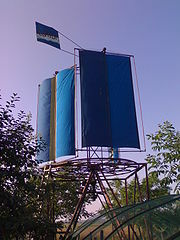 People sometimes opt to install the turbine themselves. After installation, there are maintenance costs, as with any mechanical device. These are said to average approximately 1% of the original cost per year. The blades and bearings need to be replaced approximately every ten years. The wind turbine can last 20-30 years (or longer) if properly installed and maintained. It must be oiled, greased and safety inspected regularly. Bolts and electrical connections must be checked annually, along with checking for corosion and to ensure proper tension on the guy wires. In cold conditions the turbine will have to de-iced and the batteries must be stored in an insulated place. Turbines should never be placed on a rooftop, as they are said to cause damage to the roof through vibrations. There have also been some complaints of noise or vibrations causing discomfort to those living inside a home with a turbine on the roof. The turbine does produce noise. From a distance of 250 m away a typical wind turbine produces approximately 45 dB (A) decibels) of noise. This is similar to the noise inside a typical office building. 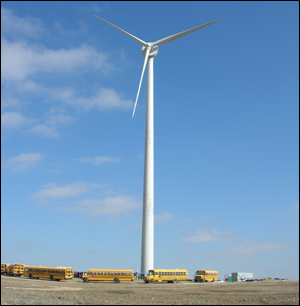 If not properly installed or maintained, turbines have the potential to get louder. The blades of most turbines are made of fibreglass or wood, and as such are transparent to electromagnetic waves such as radio and tv. They must be placed in a large open area with a certain level of wind (which varies depending on the type and size of the turbine). It is recommended to have them in an open area free of trees or buildings, approximately 1/2 an acre or more in size for best use. From what I have read, the claim that wind turbines are dangerous to birds is misleading, with a large window on a home posing more of a threat. This can be reduced with certain measures, such as netting. Wind power does not create toxic by-products in its generation. Some of the material inside the batteries can be toxic, and should be disposed of properly. Overall, the environmental impact and toxicity of turbines is considerably less than the use of fossil-based or nuclear energy. The electrical components should be stored properly to keep away children or animals, like any other mechanical or electronic devices capable of carrying electricity. There are a couple types of wind turbines, the horizontal axis wind turbine (HAWT) and the vertical axis wind turbine (VAWT), a design more like an egg-beater. An adequate wind turbine can generate 50-100%+ of a household energy needs. If it creates a surplus of energy, this energy can usually be sold to a local energy provider. How much do you pay for energy every year? If your energy bill was $0 every year, how much would you save? How long would these savings take to pay for the system? Probably much less than 20 years, the lifespan of a typical wind turbine. A wind turbine is not for every property or person, and is best used in combination with other energy systems (such as passive heating and cooling, geothermal systems and solar devices). But if you live in a rural environment and have space available, it is an option you should consider. There are government grants available to help subsidize the costs, and savings in the long term will help pay for the system. The more we move towards alternative renewable energies, the more options there will be and the cheaper they will become.